What has brought a hundred people from Costa Rica, sixty people from Peru, seventy-five more from nations in West Africa, and five hundred fifty local residents to venture to West 190thStreet? Announced in March 2015 by Pope Francis, the occasion is a period of prayer celebrated by Roman Catholics that began in December 2015 and will last until November 2016. The focus is on God’s forgiveness and mercy, and Church leaders observe a time of universal pardon and remission of sins. Devout observers travel to sites around the world to gather, sing, meditate, and pray. One of those destinations is the unique mid-century modern chapel on Fort Washington Avenue in Washington Heights. The Saint Frances Cabrini Shrine is just outside the entrance of Fort Tryon Park. 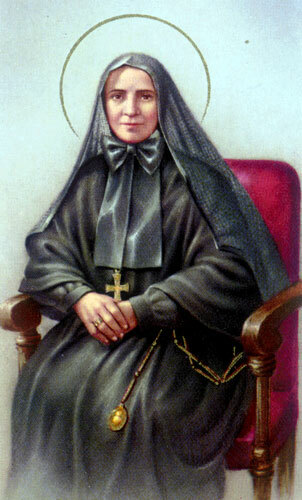 It is named for the formidable Saint Frances Cabrini, patron saint of immigrants. 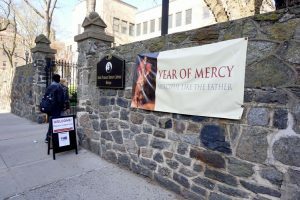 The shrine is one of only three specially designated pilgrim sites in New York City where the devout may visit to receive special grace and inspiration. Many arriving pilgrims are drawn by the presence of the Holy Doors, which were blessed last November by Bishop Gerald Walsh, who serves as vicar general of Roman Catholic Archdiocese of New York. The visitors pause outside the doors to gather their thoughts. Some enter the chapel on their knees, some holding hands with loved ones, some singing; but most walk through the doors in mindful quiet. Many are also attracted by the remarkable story of St. Frances Cabrini, also known as Mother Cabrini. Maria Francesca Cabrini was born on July 15, 1850, in the Italian town of Sant’Angelo, south of Milan. She arrived in New York as a young missionary to serve the Italian immigrants who had settled in New York. This was one of many institutions that she established. In fact, she was responsible for founding a staggering total of 67 schools, hospitals and orphanages in her 67 years of life. It was in 1899 the Mother Cabrini discovered the property where the Shrine now stands. The site is on Fort Washington Avenue. She died in 1917 and in 1946, became the first American citizen to be canonized by the Roman Catholic Church. The Shrine will be celebrating Mother Cabrini’s birthday on July 23 with a family friendly day of special Masses, food and refreshments, and outdoor activities. It is open to the public and all are invited. The Mother Cabrini Shine is located at 701 Fort Washington Avenue. For more information and to experience a virtual tour of the Shrine, please visit bit.ly/29yvXJh or call 212.923.3536.